On this date in 1945, ten days after Japan had agreed to uncon­di­tional sur­render, two U.S. Army pilots flying P‑38 Lightnings on armed recon­nais­sance landed on Kyūshū Island, the southern­most Japa­nese Home Island, after one of the P‑38s ran low on fuel. The two pilots became the first Amer­i­cans to land in defeated (though not yet occupied) Japan. An hour later, in the pre­sence of Japa­nese Army per­son­nel, a B‑17 Flying For­tress landed on the same air­field to assist the two pilots in refueling the plane for its return flight to Okinawa. On Septem­ber 2, six years and a day after Ger­many precip­i­tated the global con­flict by invading neigh­boring Poland, Mac­Arthur headed the Allied dele­ga­tion on board the battle­ship USS Missouri that brought World War II to an end by accepting Japan’s for­mal sur­render. The Missouri lay exactly four and one-half miles north­east of the spot where, on July 8, 1853, Com­mo­dore Matthew Perry had anchored four ships of the U.S. Navy’s Far East Squad­ron, which flew an Amer­i­can flag of thirty-one stars. Ninety-two years after the “opening of Japan,” Perry’s flag was on promi­nent dis­play when a nine-mem­ber Japa­nese dele­ga­tion, traveling through burnt-out cities, arrived at its des­ti­na­tion. 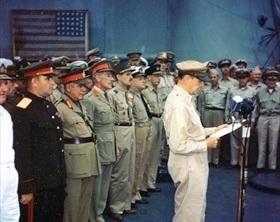 The Japa­nese signed the sur­ren­der docu­ment at 9:05 a.m. Gen. MacArthur signed for the United Nations and U.S. Fleet Admiral Chester Nimitz, who had directed much of the Paci­fic War, signed for the United States. 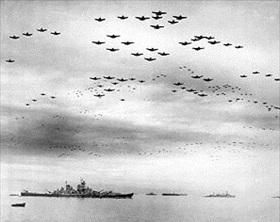 Minutes later, in a show of the mas­sive air power that had ended the Pacific War, 1,500 car­rier air­craft and 500 B‑29s flew over the armada of U.S. and British ships that filled Tokyo Bay. 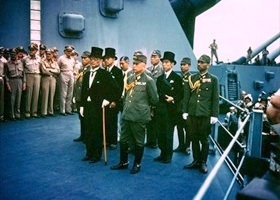 Left: The Japanese delegation shortly after arrival on board the USS Missouri, Sun­day, Septem­ber 2, 1945. Leading the dele­gation was Japa­nese Foreign Affairs Minis­ter Mamoru Shige­mitsu (with cane). Signing the Instru­ment of Sur­render for the Japa­nese mili­tary was Gen. Yoshi­jirō Umezu (on Shige­mitsu’s left). In 1948 Shige­mitsu was sen­tenced to seven years im­pri­sonment by the Inter­na­tional Mili­tary Tri­bunal for the Far East. Paroled in 1950 Shige­mitsu became Deputy Prime Minis­ter of Japan in 1954. Umezu, final Chief of the Im­perial Japa­nese Army General Staff and a mem­ber of Emperor Hiro­hito’s Supreme War Council, was tried as a war crimi­nal by the same tribunal, which sen­tenced him to life imprisonment. He died in prison in 1949. 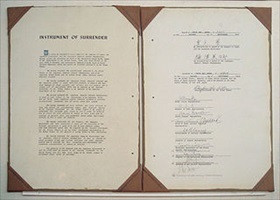 Right: The Japanese Instrument of Surrender was the written agree­ment that enabled the sur­render of the Empire of Japan, marking the end of World War II. It was signed by repre­sen­ta­tives from Japan, the U.S., China, Great Britain, the Soviet Union, Aus­tra­lia, Canada, France, the Nether­lands, and New Zea­land aboard the USS Missouri in Tokyo Bay on Septem­ber 2, 1945. The Allied copy was pre­sented in leather and gold lining with both coun­tries’ seals printed on the front, where­as the Japa­nese copy shown here was bound in rough canvas with no seals on the front. Left: General of the Army Douglas MacArthur, Supreme Allied Com­mander, opened the 20‑minute sur­render cere­mony on the veran­da deck of the USS Missouri. Repre­sen­ta­tives of the Allied Powers (United Nations) are lined up behind him. Mounted behind the rows of men is the 31‑star flag (displayed back­ward) that Com­mo­dore Matthew Perry had brought ashore to Japan in 1853. The fragile flag was retrieved from the Naval Aca­demy’s museum in Annap­o­lis, Mary­land, and delivered on August 29, 1945, to Adm. William “Bull” Halsey, Com­mander of the U.S. Third Fleet, whose flag­ship was the USS Missouri. Victor in war, Mac­Arthur stayed on in Japan to manage the U.S. occupation of that country. Right: U.S. Navy carrier planes fly in formation over the U.S. and British fleets in Tokyo Bay during the sur­render cere­mony. The USS Missouri is at left. On the battle­ship’s surr­ender deck were over 130 offi­cial guests—Amer­i­can, British, Chinese, Soviet, Austra­lian, Cana­dian, French, Dutch, and New Zea­land offi­cers—who were invited to witness Japan’s formal capitulation.